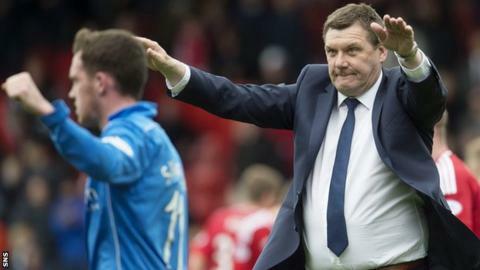 St Johnstone have secured a place in next season's Europa League qualifiers after Inverness Caledonian Thistle won the Scottish Cup. Caley Thistle had already sealed a place in the qualifiers by finishing third in the Scottish Premiership. But they now enter the competition later, as Scottish Cup winners, after beating Falkirk in Saturday's final. And Saints, who were fourth in the Premiership, take the final European place available through the league. It will be the Perth club's fourth successive season in the Europa League qualifiers, but they are yet to reach the group stage of the competition. The draw for the first qualifying round, which will feature Saints and Premiership runners-up Aberdeen, will take place on 22 June. The first leg will be on 2 July, with the return a week later. Inverness, who will be taking part in their first European campaign, will enter the competition in the second qualifying round, which will be played on 16 and 23 July and the draw also on 22 June.